You want to be a mountain, right? Sure you do. Who wouldn’t want to spin endlessly in space, with no chores to do and none of those pesky bodily functions to manage. It seems peaceful. Serene. Spinning in the night. You might have seen creator David O’Reilly’s work in the film Her, for which he animated the alien child/hologram sequences. He’s now turned his hand to proper gaming. Sort of. You’re a mountain. There’s not a lot to do, okay? It’s essentially a screensaver, albeit one that won’t actually save your screen. Playing on a PC, you can zoom in and out of the mountain, change the viewing angle or swipe to spin it slightly faster. The bottom two rows of your keyboard will play notes, like a piano. I’ve heard that playing certain sequences will affect your mountain in some way but since I’m a talentless hack, I can’t play a tune on a real piano, let alone translate it to a PC keyboard. I did manage to figure out that my mountain would speed up when I hammered a key on the middle row and the bottom row. This is the full extent of my mountain prowess. Here’s 12 hours of my mountain adventure compressed into less then three minutes. 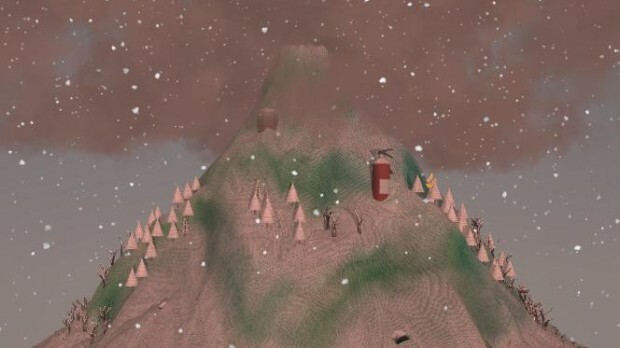 Get your own virtual bonsai mountain here for PC, Mac, Linux and iOS. It’s only a quid. May you have better luck than I.